For the last two years, the IT department has been working on a project to improve identity, communications, and passwords across campus. We’re finally ready to start rolling pieces of that out. And you, lucky Drupalers, are getting to test one of the very first pieces. Starting on October 9th, when you log into Drupal, you’ll be automatically taken to the CAS login page. What’s CAS? CAS provides a Central Authentication Service, which means that when you log into it, you’re actually logging into all the services that CAS is aware of. And when you log out, you’re logging out of all the services that CAS is aware of. In the future, this is going to let us do some pretty neat things. For example, that means after you log into Drupal, when you go to myLane and press login, you’ll just automagically be logged in – without having to enter your L Number and password all over again. But for now, it’s just going to look like a different login page. So what’s it look like? No, really, that’s it. 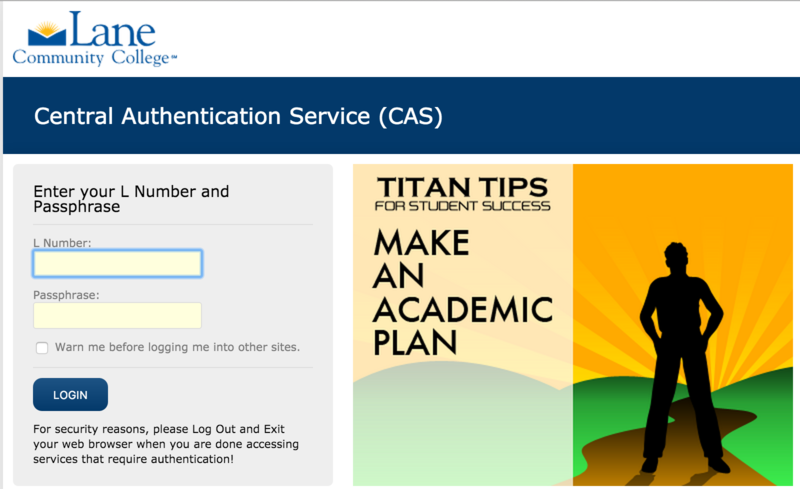 When you go to the Drupal login page, it’ll automatically go to the CAS login page. After you log in, you’ll go back to Drupal. It’s super important that you remember to log out when you’re all done. Since logging into CAS logs you into all services, if you forget to log out that means the next person that comes up to that computer could not only use Drupal as you, but also use any other CAS enabled service (and eventually, that’ll mean almost everything at Lane!). So please, hit the log out button when you’re done! This entry was posted in Drupal and tagged CAS, Drupal by Kyle Schmidt. Bookmark the permalink. If we don’t happen to use drupal on a particular day (and so, don’t log in to Drupal) but we log in to MyLane, will we still be logged onto everything? Once we launch CAS, you should stop thinking about logging into applications, and start thinking about logging into Lane. Not every Lane service will use CAS. We’ll be launching CAS for drupal on one day, but it may take myLane several more months. In between, logging into Lane (that is, logging into CAS) has nothing to do with logging into myLane. So there’s a couple answers. Until myLane starts using CAS, logging into myLane will still be completely independent from everything else (except Banner Self-service) – just like now. Once myLane and drupal are both using CAS, then it’s different. Then if you don’t log use drupal some day, but you do use myLane, you’ll have been prompted to log into CAS. So you will be logged into Lane. From a super-strict technical standpoint, you won’t be logged into Drupal. But from a practical standpoint, you will be, since even though you haven’t used Drupal that day, because you have used a CAS service (myLane), all you’d need to do is visit the drupal login page from your computer (lanecc.edu/user) and you’re logged into drupal without having to enter your password again. Will H/R’s LEO eventually be part of the circle? Right now, it isn’t on our roadmap. But if LEO supports CAS, we could have a conversation about it many, many months in the future.